The Chartered Society of Physiotherapy said inactivity resulted in ill-health and therefore more time off sick. 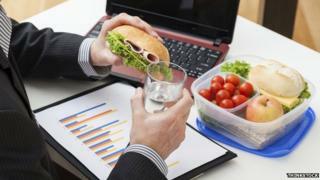 The study of about 2,000 people revealed that one in five employees worked through their lunch. Half of those who did manage to take a break ate at their desk, one in five went outside and 3% went to the gym. The Chartered Society of Physiotherapy called on employers to encourage staff to be more physically active during the working day to reduce their risk of developing health problems. These range from back and neck pain to more serious illnesses such as cancer, heart disease and stroke. Only a third of workers said their employer provided any kind of exercise opportunities, such as subsidised gym membership, lunchtime running club or an after-work fitness class. Karen Middleton, chief executive of the society, said: "Full-time workers spend a significant bulk of their week at work or travelling to and from it. "Finding ways to build in time to do at least 30 minutes of moderate intensity physical activity, five times a week, can be a challenge. "Free facilities like outdoor gyms, or simply going for a brisk walk at lunchtime, can help people to be more active during the day. "The consequences of not doing so can be devastating with many people suffering ill-health and prolonged spells off work." She added: "Aside from the human cost the price of inactivity for employers can be vast with higher sickness absence costs and lower productivity. "It is in everybody's interests to find ways to tackle the enormous problem of inactivity in the UK and we would encourage people to take responsibility for their own health." The survey was conducted for the Chartered Society of Physiotherapy and health insurer Aviva, for the society's annual Workout at Work Day on Friday.